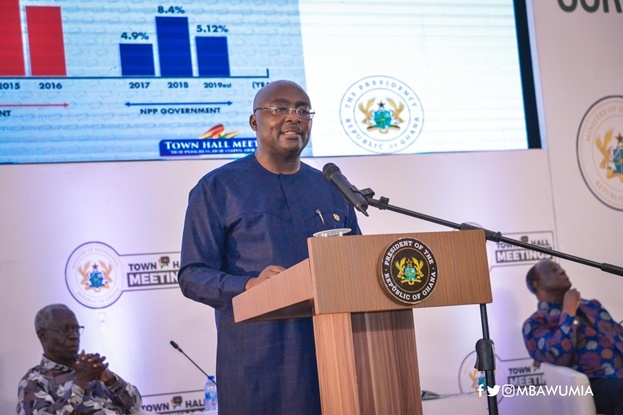 Vice President Dr. Bawumia has assured the nation that the strong macro and microeconomic fundamentals arising from innovative policies and programmes implemented over the last two years have placed Ghana in a strong economic position and made the future very promising. The Nana Akufo-Addo government, according to Vice President Bawumia, has undertaken major structural reforms and implemented policies and programmes that have begun to yield fruit and portend a future full of opportunities for the nation. “Looking to the future, one can say that Ghana’s future under the leadership of President Nana Addo Dankwa Akufo-Addo is bright and the prospects of growth are promising,” the Vice President declared at the maiden Economic Management Team (EMT) Town Hall Meeting in Accra on Wednesday, 3rd April, 2019. The Townhall Meeting, coming a day after Ghana officially exited the IMF’s Extended Credit Facility Programme, was attended by over 500 stakeholders representing farmers, market women, trade unions, teachers, Parliamentarians and other identifiable bodies, and provided an opportunity for a frank interaction between the audience and the nine men who make up the EMT. The Meeting was under the theme “Our Progress, Our Status, Our Future”, and provided an opportunity for crucial feedback for the EMT, to influence future government policies. “We are implementing a plan to change the structure of the economy,” Vice President Bawumia maintained, explaining, “Two years into the Planting for Food and Jobs and now for Exports, we have learnt a lot and we are optimistic. “Under the One District and One Factory and the stimulus package for businesses, industry growth is on the uptake. Gradual improvements in the Ease of Doing Business and the National Entrepreneurship and Innovation Programme are stimulating business start-ups. “The emerging automobile industry, the integrated bauxite and aluminium industry to be followed by iron and steel, petro-chemical and value addition processing are our pillars of diversification to change the structure of the economy. And we must train our young labour force to match these changes in the economy. “The pace of digitization that is currently underway will make Ghana one of the most digitized economies in Africa in the next five years. Some of the forthcoming projects, he indicated, include the Sinohydro Master Project Support Agreement, 12 Fish landing sites, the Pwalugu multi-purpose dam, Bui solar hybrid and irrigation project, resumption of train services on the refurbished Accra to Tema railway line, construction of 10 Youth and Sports Resource Centers of Excellence, provision of thousands of housing units for the security services, and a major digitisation drive designed to make Ghana the most digitally integrated society in Africa in a few years. While acknowledging that there was still a lot of work to be done, Vice President Bawumia was optimistic about Ghana’s prospects. “We will be the first to admit it has not all been rosy and that there is still a lot more to do; and the full impact of some of our initiatives are not immediate but will be very significant to the country in the very near future.